Written by PAUL LEVITZ & KEITH GIFFEN Art and cover by KEITH GIFFEN & JOHN DELL The legendary team of Paul Levitz and Keith Giffen reunite on the Legion for the first time in 20 years! 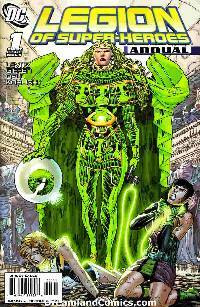 And their next 31st century masterpiece introduces the all-new, all-deadly Emerald Empress! She's ultra-twisted! She possesses entire planets! And she devastates the Legion so completely, one Legionnaire will never be the same!